Dotmar EPP using Nylon for 70 years nearly, after the first experimental testing used it as sewing thread in parachute fabric and in women's hosiery. For industrial uses, manufactured fibres such as nylon have relentlessly replaced traditional materials in applications ranging from showpiece uses (such as artificial organs and construction materials for moon-based space stations) through to the more mundane but equally important uses (including high load bearings, wear pads, support and guide wheels, wire rope sheaves, buffer pads and gears). Nylon (or Polyamide, Ertalon and Nylatron, the formal names of two of Australia’s most frequently used industrial nylons) has changed with the times. In turn, it is changing the habits of Australian component engineers, who historically have showed a fixation for using metal-based industrial components in original equipment manufacture and maintenance requirements. The materials’ characteristics and performance levels are often far better suited to particular applications than those embodied by metal alternatives – and are also often less expensive to use. Production efficiencies are often increased and downtime greatly reduced by the use of nylon products. As a result, the material is gaining a greater presence in mining, manufacturing, materials handling, marine, transport and packaging industries as well as general engineering. In mining applications, Ertalon is excellent as a roller for electric hoists, drag chain wear parts, monorails and travelling cranes, as well as pulleys and sheaves for overhead cableways. In the marine industry, parts are engineered from Ertalon for use, ship winch machinery bearings, stern shaft bearings, and wire rope pulleys. The Ertalon series available from Dotmar EEP comprises three standard nylon grades in distinct tones and colours: 6SA (in white or black), 66SA (cream or black), 6PLA (ivory). In addition, there are four special grades: 4.6 (in reddish brown), 66-GF30 (black), 6XAU+ (black) and LFX (green). As a general-purpose grade for mechanical construction and maintenance, Ertalon 6SA provides an optimal combination of mechanical strength, stiffness, toughness, mechanical damping properties and wear resistance, together with a favourable electrical insulating ability and good chemical resistance. Carrying a higher mechanical strength, stiffness, heat and wear resistance than Ertalon 6SA, the cream coloured Ertalon 66SA also has a better creep resistance but with reduced impact strength and mechanical damping ability to make it more suitable for machining on automatic lathes. The method used to manufacture Ertalon 6PLA (a polymerisation in the mould) allows manufacture of large-size stock shapes as well as custom casting that requires only minimal machining. The characteristics of this cast nylon grade come close to those of 66SA. Within the group of special grade nylons, the reddish-brown coloured Ertalon 4.6 has applications in the temperature area between 80°C-150°C where the stiffness, creep resistance, heat aging resistance, fatigue strength and wear resistance of the standard grade 6SA and 66SA, POM and PETP fall short. With a 30% glass fibre reinforced nylon, the Ertalon 66-GF30 (black) provides better strength, stiffness, creep resistance and dimensional stability compared with virgin 66SA, and allows higher maximum service temperatures. Ertalon 6 XAU+ has a heat stabilised cast nylon 6 with a very dense and highly crystalline structure for better technical properties than conventional extruded or cast nylons. In addition, the black-coloured product has excellent resistance to creep and wear, better heat aging performance and machinability, the grade is recommended for bearings and other mechanical parts that are subjected to wear in operating temperatures above 60°C. Specifically developed for manufacture of non-lubricated moving parts, the self-lubricating Ertalon LFX (green-coloured) broadens the application base of nylons due to its reduced coefficient of friction (-50%) and improved wear resistance (up to x10). Advantages include a lower heat build up (hence a higher load carrying capability), longer operational life and less stick-slip. Nylatron GS the addition of MoS2 renders this nylon somewhat stiffer, harder and dimensionally more stable than Ertalon 66SA, but results in some loss of impact strength. The nucleating effect of the molybdenum disulphide results in an improved crystalline structure enhancing bearing and wear properties. Nylatron MC901 this modified cast nylon 6 grade with its distinctive blue colour exhibits higher toughness, flexibility and fatigue resistance than ERTALON 6PLA. 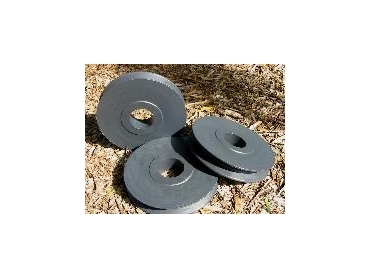 It has proven to be an excellent material for gear wheels, racks and pinions and any application with which requires extreme impact resistance. Nylatron 703XL is a new internally lubricated cast nylon for special area application. Zero stick / slip is its differentiating feature, in which static and dynamic coefficients of friction approximate each other at virtually every point over the product’s useful range. ‘Zero Slip-Stick’ performance permits precise and efficient motion control of machinery components including wear pads, bearing blocks, wear guides and linear bearings. Machinery equipped with Nylatron 703XL can accurately produce the smaller movements made possible by today’s sophisticated control devices. Telescoping or sliding parts – such as those in cranes and materials handling equipment – move smoothly over pads made from Nylatron 703XL, without sticking or jumping. This represents a major advance in engineering thermoplastics formulated for wear resistance and fine motion control in the construction, production and processing equipment industries.